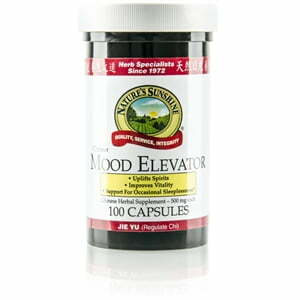 We recommend the TCM version of this product for more potency and a lower cost per day. Why TCM? 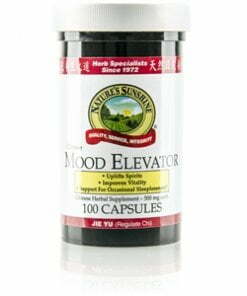 Nature’s Sunshine Mood Elevator, Chinese, draws on traditional Chinese medicine for this herbal blend. The 17 included herbs are considered a “fire-enhancing” combination because of their ability to release the chi, or vitality. Bupleurum root and cyperus rhizome, two herbs in the formula, may nourish the liver, the key organ in supporting mood, according to Chinese philosophy. Jie yu, Chinese for the liver, means to “relieve depression,” and Chinese traditional medicine practitioners claimed that a healthy liver helped ensure a positive mood. Instructions: Take four capsules with a meal twice daily.